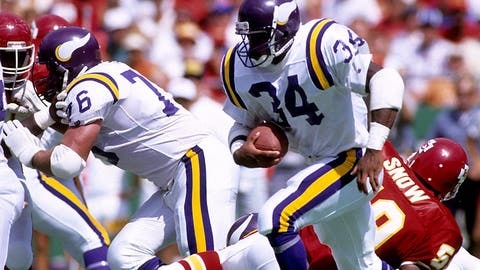 Herschel Walker went to the Vikings in a trade with the Cowboys regarded as one of the NFL's most lopsided. Walker never had a problem doing that. As a freshman at Georgia in 1980, Walker’s cartoonish speed and power seemed to bend reality. His first touchdown run against Tennessee inspired one of the most memorable lines in broadcasting history. “My god, a freshman,” an astonished Larry Munson said. Well, Walker is out to stun again, this time as the man behind something he’s calling Herschel’s Raw Talent, an Internet-hosted America’s Got Talent-style reality competition show. He plans to start it in Minnesota, where he spent three of his 12 NFL seasons. "I had a great time in Minnesota," Walker told the TwinCities.com. "I don’t think all the people got a chance to see all the things that Herschel Walker could do, and I just want to give back." That hints at a dissatisfaction with his NFL career, which would be understandable. Walker won the Heisman Trophy in 1982, and made the Pro Bowl in his second and third NFL seasons. But in 1989 he was the centerpiece of what is now known as a legendarily bad trade. The Minnesota Vikings gave the Dallas Cowboys six draft picks for Walker – draft picks that became Emmitt Smith, Russell Maryland, Kevin Smith and Darren Woodson. It was the launching point for the Cowboys’ dynasty in the 1990s. Meanwhile in Minnesota, some people said the team wasn’t using Walker right and the team wondered just how committed he was to football, an argument that was strengthened by Walker’s joining the United States Bobsled and Skeleton Federation. I don’t think all the people got a chance to see all the things that Herschel Walker could do, and I just want to give back. Thus commenced the “this guy hasn’t been all that productive but remember how talented he is?” phase of Walker’s career. He ran for 1,000 yards for the Eagles in 1992, but that would end up being his second and final 1,000-yard season. Since retiring from football in 1997, Walker has done well in the technology and food industries, and is applying that tech experience to Herschel’s Raw Talent. He got the idea from watching YouTube videos. He saw all these people uploading videos of their talent, getting hundreds of thousands of hits and not getting anything from it. "It’s a company that does e-commerce off video," Walker said of Herschel’s Raw Talent, part of his firm 34 Commerce. "I’m looking at so many videos of these young kids on YouTube. What I’m doing is starting in January in small cities. I want to come to a small town and grab some of the local talent and then put them on video players and they can do e-commerce where I can put some money back in their pockets and put some money in the state and the county." Walker’s idea is, in name alone, a little narcissistic, but it is equally altruistic. For one thing, this isn’t going to be “American Idol” showing up in all the big cities. Walker is taking his show to small towns like the one in which he grew up. Herschel’s Raw Talent will show up, hold a talent show and give prizes to the top finishers. He plans to donate 80 percent of the profits to charity. ”The videos they make, they don’t make anything from now,” Walker said. “Then we’ll maybe take the top 10 videos and help them market those videos, so they can go out and make some money." • Deadspin pulls back the curtain on how it broke the story of the Manti Te’o hoax. • The Knicks’ big plan, according to ESPN.com, is to hope Rajon Rondo will force a trade to them. • The Big Lead compiled the best catches. • Derek Anderson live tweeted a police standoff in Charlotte. Got a stand off in uptown this am! Police chase then an accident.. Got the negotiator on the mega phone now! • Now, back to hard news on the hardwood. Michigan forward Mitch McGary is out. Russell Westbrook is out, too. and the Thunder are not-so-subtly blaming the Rockets’ Patrick Beverly. • Jadeveon Clowney has had a couple of speeding issues recently, but he doesn’t appear to be holding it against the men and women of law enforcement. Sam Presti avoids using Patrick Beverley's name on conference call. Says latest surgery stems from "a player crashing into his knee." • Jay-Z helped Geno Smith deal with the haters. • This lady ran 300 miles without sleeping. • Tony Gonzalez is playing his final NFL game on Sunday, and the Falcons are presenting the future Hall of Famer with a half-Falcons, half-Chiefs helmet. • A cow groped Johnny Manziel. • Arnold Palmer visited some sick children at the Arnold Palmer Hospital. Warning: You will cry.